Better yet, use a dark, brambly red like Zinfandel and add star anise, black peppercorns or cinnamon stick to expose the peppery and more sultry flavors of your base wine. One last trick…add a creative simple syrup to peak the natural flavors of the base wine you’re using to complete the palate of your tasty wine based cocktail. And last, don’t be afraid to use herbs and even vegetables! Sometimes ingredients like basil or cucumber add even more acidity to an already zesty base wine.When it comes to your fruit, don’t be afraid to even put a light char from the grill on a few of your favorite fruits, for added interest (pineapple, oranges, star fruit, peaches, mango & plums). The possibilities are virtually endless and all equally, tempting! What about those Shrubs + Bitters? 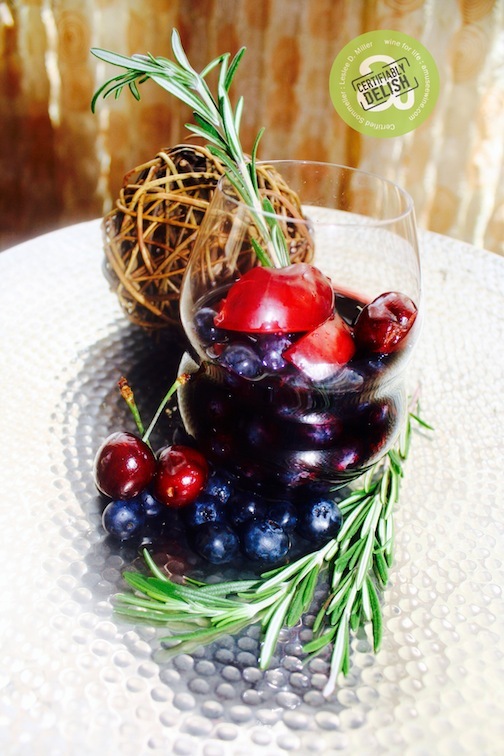 For example: Add a black pepper cherry shrub to a spicy Zinfandel or a sultry Malbec sangria, a cherry almond bark bitter to a Pinot Noir rosé sangria or an orange bitter to a Chardonnay or Viognier sangria. A fun way to take your summer sipper up a notch! Use a few Simple Syrups to kick up your mix, try these! Add water and sugar to a medium saucepan. Heat over medium high heat, stirring a couple of times to dissolve the sugar, until mixture just boils. Remove from heat and cool to room temperature. Transfer mixture to a sealed container—a glass jar works nicely—and store in the refrigerator. Add 1/2 cup of unpeeled, finely chopped ginger to the water and sugar mixture. Boil for 5 minutes. Cool and store syrup with ginger in it; strain before adding to sangria. Instead of water, use 1/2 cup orange juice plus 1/2 cup lemon juice. Add the zest of one orange and one lemon. Cool and store syrup with zest in it; strain before adding to sangria. The type of wine you choose for your sangria depends on the flavor you’d like to create: fresh and light, rich and robust or bold and spicy! Light and grassy! Fresh notes of kiwi, lime zest, basil, and honeydew will taste just like summer here. Citrus splash! Pairs perfectly with tangerine, blood orange, and grilled lemon.Think bubbly! 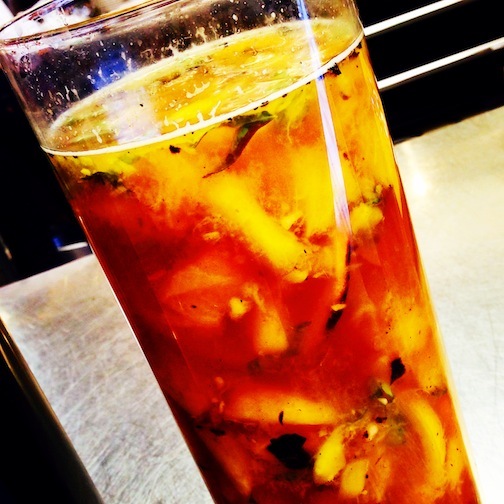 Pretty as a picture: Ginger, white peach, mango, and mint will make the flavors of Riesling come alive. Floral & supple. Honeycomb, slices of rich apple and peach are great complements. Cherry bomb! Combine with a bright herb like basil and lighter red fruits (cherry, cranberry, raspberry). Bold, with muscular notes that work well with blackberry, whole peppercorns, and cinnamon stick. Even grilled black fruits work best here! Peppery, with a hint of smoke. Pair with blueberry, raspberry, star anise, vanilla bean, clove, and black pepper. Combine with sage, oregano, thyme and red fruits (strawberry, raspberry, plum) for a taste of the old world. Quick Tip: Read the back of the bottle! Does the description read: blackberry, cherry & anise? Then throw those same ingredients into your sangria jar with that exact bottle and voila! 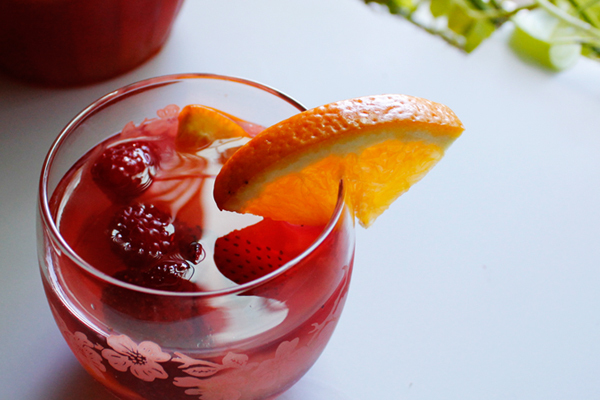 A fool proof way to build the best Sangria.